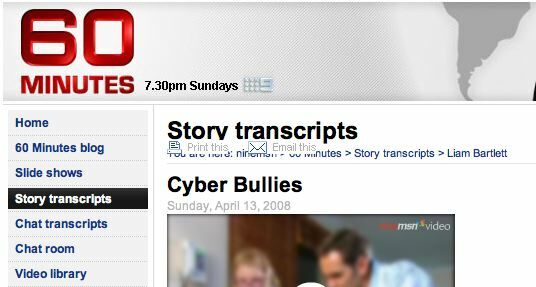 Last night on the Australian 60 Minutes there was a story on Cyber Bullying. While this is an important issue and needs more public discussion and eduction last nights show was a very poor attempt to discuss and raise this issue, it was something more akin to the typical TodayTonight and A Current Affair offerings. One of the things that I am starting to change my mind on relates to a statement made at the start of the show that said " student know way more than we do" meaning adults/parents. While this off hand remark would have everyone nodding, my recent experiences in schools (secondary) is that the majority of student certainly know a lot more than their parents about the online world, and they certainly do not have the fear or trepidation when trying new things or communicating with others online. But student do lack the skills and knowledge to successfully communicate with people - they are missing the knowledge and information to ensure that they know how to be a successful and responsible cyber citizens. Last nights show really missed a good opportunity, but was expected given the shock/horror approach taken by these shows today. If I were to guess, it will not be too long before we see a panel session on 60 Minutes with so called experts talking about Cyber Bullying and the growing epidemic. Lets just make sure we make the most of the opportunity. As an parent and teacher we need to be talking to our children/students and ensuring that they have the knowledge of how to act online - and that means parents taking the time to spend time with your children. Nothing new, nothing magical but something very special.